The New York Department of Sanitation has been busier than usual removing what they believe are scam drop-off bins for donated clothing. Thirty-seven huge metal receptacles, which were illegally placed on the streets of New York, have already been removed over the past half a year. That figure represents a 23 percent surge in the number of bins removed since last year, when only 30 were taken away during the entire fiscal year. The large pink bins began to appear on New York sidewalks over a year ago in Brooklyn, Queens, Staten Island and the Bronx. None of been spotted yet Manhattan. Their purpose is ostensibly to be an easy way for good citizens to donate no-longer-needed used clothing to charitable organizations; to help clothe the poor and raise funds for related organizations. Unfortunately, in the case of these bins, it is unclear in whose hands the clothing ends up. “They are a scam and people need to be careful who they donate clothing to,” said City Councilman Daniel Dromm of Queens. He is suspicious of the bins, believing that the clothing does not end up helping the poor. “They’re eyesores and attract vermin,” he added. In January the Sanitation Department warned the owners of one bin located on 18th Avenue near East Second Street in Kensington with a yellow sticker saying that the owners had 30 days to remove it from the street. During that time the bin began to overflow, leaving an unsightly mess of discarded clothing on the street next to the bin. Pedestrians and businesses were, to say the least, unhappy with the situation. Finally the bin was removed, taken apart, and recycled for its metal. Not all the illegal bins have yet to be removed. Brooklyn has taken away the most, removing 24 since July 1. The Bronx took away eight, Staten Island removed four, and Queens, one. Dromm is pushing for a law that will required all bins placed on private property to have a name and phone number clearly marked. It will also require the bin owners to list details about where the donations are going. “There's a level of deception that may rise to criminality,” Dromm said. There are legitimate methods of donating old clothing. The Sanitation Department has its own clothing drop-off charity. 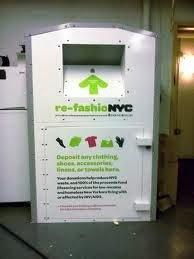 The bins for clothing heading for re-fashioNYC are found inside commercial and residential properties.